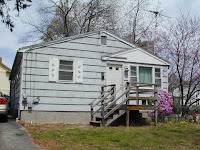 153 Finch Ave Pawtucket Rhode Island $174900!!! THIS IS THE CHEAPEST RANCH IN PAWTUCKET! Newly painted exterior and trim. Here is yet another great opportunity for you to get into a new home for under market value! It boasts 3 bedrooms with hardwoods and a fireplace in the living room. A full basement affords loads of storage room. This home needs Interior paint and a little (very little) TLC.